The result is race proven performance with a one of a kind drag race look...without the inherent drawbacks of a sidewinder. There is no reduced right hand cornering clearance or rear brake lever to pipe clearance issues. NO fairing modifications are required and the stock oil cooler and lines remain intact. The Brock's Performance Brick can also be used! The SHORTMEG Exhaust System has a more aggressive sound than our Generation 3 StreetSmart System, but it still acceptable for street use with the baffle installed. By removing the billet aluminum baffle, the user can unleash a race only sound which mimics the booming tone of an NHRA Prostock machine! The front section (from the engine to the Muffler) is constructed of an aerospace quality ultra-light stainless steel. The SHORTMEG package comes with a Race Megaphone with REMOVABLE billet Aluminum baffle. The total system weight is just over 8lbs. 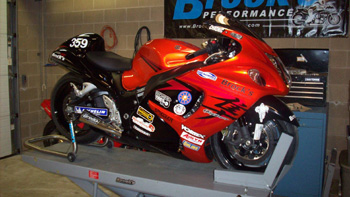 Brocks Performance Products announces their SHORTMEG Exhaust package for the 2008 Suzuki GSX1300R Hayabusa. Not just an off-the-shelf pipe, these systems are complete performance upgrade packages specifically designed for "serious stock" and Large CC or heavily modified Busa. The larger and more powerful your engine is... the better this system functions! BUT stock engines LOVE this system also, with power levels which rival even our Generation 3 system! Included are specially-designed lightweight stainless steel header pipes joining to a full race megaphone and complete instructions. Maps are available by submitting a map support request form at http://www.brocksperformance.com/mapsupport.html for use in conjunction with the Dynojet Power Commander for your year machine or the Brock's Performance/ BPD ECU. (Power Commander and/or BPD ECU not included). The Street Megaphone System is a joint effort between Brock Davidson Enterprises and Hindle Manufacturing of Canada. This partnership combines Hindle's renowned handcrafted quality with Davidson's 20 years of Sportbike drag racing experience. Davidson personally designed and hand-tuned the system specifically for the Hayabusa street bike owner who frequents the drag strip or is particularly interested in arm-straightening acceleration from a dead stop or slow roll and wants to make sure they have the fastest bike out there. 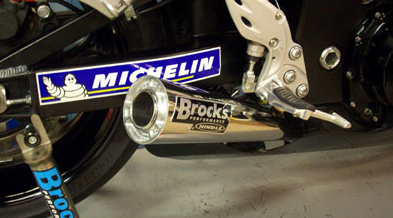 Special Note: All Brock's Performance by Hindle exhaust systems are produced exclusively for Brock's Performance Products (not to be confused with any other exhaust system on the market- including the Hindle product line) and are ***ONLY*** available directly through Brock's Performance or online here at Tiger Racing. Dynojet Power Commander TRACK maps (These allow the bike to accelerate harder in the real world!) for your specific application. Brock's/BPD ECU maps available also. Dyno maps are available upon request...if impressing your buddies is important to you. Brock's Performance Technical Assistance & Custom baseline maps for modified engine applications. StreetSmart Owners Section access: it is FREE with Your Street Megaphone purchase. This area in the Brock's Performance Information Section (Private): http://www.brockracing.com/forum/default.asp exists for a single reason....To help YOU make your bike (and yourself!) as fast as possible. If we learn a new trick or technique (which technology allows us to do frequently)...it doesn't do us any good to keep it to ourselves. We want you to be FASTER than anyone you race who does not have a Brock's Performance System. We also don't want you to follow a path to poor performance by following the advice of others who might not know as much as us... Sales pitches...know it all friends...internet yammering...what ever! If something works, we tell you. If it doesn't work...we tell you that also. It is not about money for us. We know what we sell works as good as Brock personally knows how to make it work! We also know that one poor product or idea added to our known good combination can make OUR products (and YOU!) look bad! ATTENTION: ALL Brock’s Performance “GP Style” Megaphones (Alien Head, Short Meg, Street Meg Shorty) mufflers are VERY LOUD. (Most register approximately 108 dB/A measured on the “A” scale at ½ indicated red line RPM at a distance of 0.5 meters (20 inches) in accordance with SAE J1287. The addition of our NRP-19 Noise Reduction plug results in a measurement of approximately 106 dB/A which is still VERY LOUD. All Brock’s Performance exhaust systems are FOR RACE USE ONLY with no D.O.T., C.A.R.B., or EURO emissions or sound approval. Consult local authorities for the requirements in your area. Brock’s Performance will not be responsible for noise violations (tickets) or any additional expenses incurred to convert or exchange any systems to a more socially acceptable sound level.